Ratings and rankings on any FIFA game always causes some debate and 'club worth' is no different. We're not entirely sure how the latest FIFA edition defines 'club worth' although it is likely to be based on the total value of players in the squad. It was revealed last week that according to a study by Brand Finance, Newcastle United were listed as the 10th most valuable club in England - but how does FIFA 19 rank the Magpies ' club worth? Well, Rafa Benitez's side jump one place to ninth with a club worth of £865,000,000 as Leicester City, who were ranked above Newcastle in the Brand Finance case study, drop to out of the top 10 and into 11th. 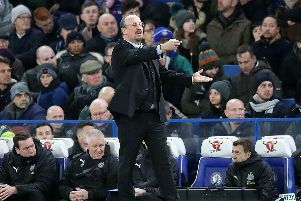 While Benitez was unable to strengthen his squad this summer, last season, Newcastle allegedly held the ninth highest wage bill in the Premier League - so that perhaps might be a reason as to why they rank so high should our prediction on how FIFA define 'club worth' be correct. Manchester United pip rivals and Premier League champions Manchester City to top spot with a club worth of £3,096,720,000 compared to the City's £2,464,000,000. Chelsea and Arsenal complete the top four while Tottenham Hotspur, Liverpool, Everton and West Ham United all rank above Newcastle. Cardiff City are handed the lowest club worth of £321,000,000 with Huddersfield Town and Fulham forming the bottom three.